My homemade chicken and dumplings from scratch are amazing. Rich chicken flavor and a breeze to make. This easy dumpling recipe is beyond words. Light and fluffy; my favorite comfort food. 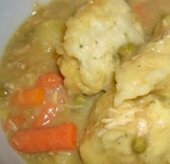 I also give more tips below to change this to Chicken and Dumplings stew. Thick and delicious. Combine chicken, celery, carrots, onion, chicken base, parsley, salt and pepper in a large pan or dutch oven; add water to completely cover chicken. Bring to a boil; reduce heat, cover and simmer for 1-1/2 to 2 hours or until chicken is done. Remove chicken and let stand until cool enough to handle. Remove the skin and place the meat back into the stock pot. For the dumplings, sift the dry ingredients together and add the butter, cutting it into the dough until it resembles coarse meal. Add the milk - DO NOT OVER STIR. Drop by tablespoons into the chicken mixture in the stock pan. Cover and cook for 20-25 minutes. Pour approximately 5 cups of chicken broth over the chicken and veggies. Cook for about 6 hours, remove and discard the skin and cut or shred the chicken meat; putting it back in the pot. Bring the broth back to a boil and drop the dumplings in the soup. The dumplings will take approximately 45 minutes to cook. At times instead of soup, I like to make a thick chicken and dumpling stew. I will bake a loaf of bread and serve it with a fresh salad. The photo of the stew is below. 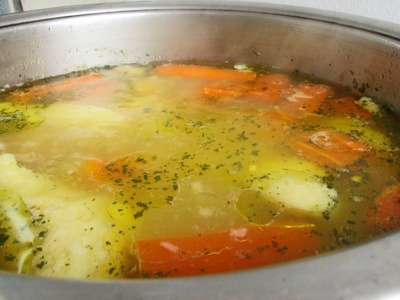 To make it you would mix the flour and broth together and add a little at a time to the soup. This is certainly comfort food at it's finest. Whisk together well and add to the simmering soup; mixing until you reach the desired thickness you want.